Our Egyptian Embassy legalisation service will ensure your documents are successfully attested for use in Egypt. This fully inclusive service takes care of the entire certification, attestation and apostille process. We can legalise all genuine UK documents in just a few days. If you need to present documents in Egypt then you will need to legalise your documents in the UK by apostille and then with the Egyptian Embassy before they will be recognised. Most orders are completed in just 7-8 working days. What Does Egyptian Attestation Look Like? Each embassy has it’s own way of attesting documents. The Egyptian Consulate in London will only attest a document that has the UK apostille attached. 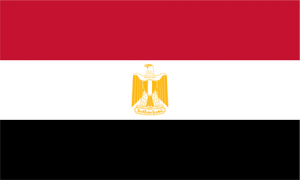 All documents attested for Egypt are issued with the apostille from the UK government. The embassy then adds two ink stamps to the back of the document or to the back of the apostille. Two further postage stamps are then added to the document before it is signed off by one of the consular team at the embassy. We take care of the complete service to make document attestation easy. Our service includes document checks, solicitor certification when required, the UK apostille and the embassy stamps. A one stop solution. Contact us today for free advice. 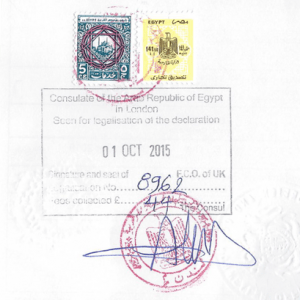 We can attest all of your business documents with the the UK apostille and Egyptian Embassy stamps.